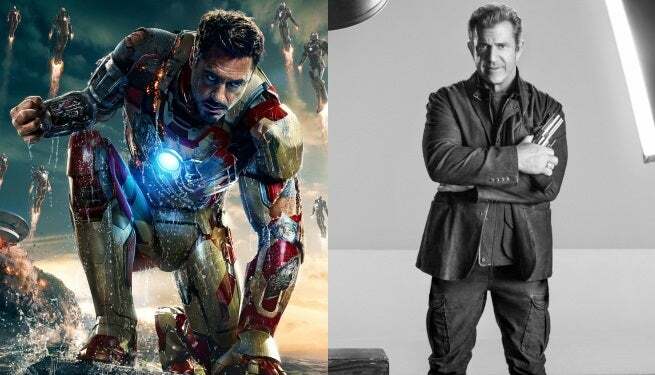 In an interview with Deadline, Robert Downey Jr. suggested that he’d be willing to go forward with Iron Man 4 if it were directed by his longtime friend Mel Gibson. Well, sort of. Downey never actually says those words. The interviewer provides the narrative idea that Downey doing Iron Man 4 for Gibson would be a way of repaying Gibson for the help he had provided to Downey during Downey’s self-destructive period. Downey only actually says “Correct” and “Why not?” after seeming to be painted into a corner. Gibson has had trouble breaking back into Hollywood since being ostracized when his struggle with alcoholism led him to make public, anti-Semitic comments. Downey had similar trouble breaking back into Hollywood due to the high insurance premiums involved with hiring him, because of his problems with addiction. Gibson, who became friends with Downey while filming Air America together, put up the money for an insurance bond for Downey, which was instrumental in getting him back into mainstream Hollywood, putting him on track to become Marvel’s Iron Man. As mentioned, the two are friends, Downey does owe Gibson at least a debt of gratitude, and Downey speaks in the interview about how changed Gibson is. In 2011, in his acceptance speech after being honored with an American Cinematheque Award, Downey even publically called on the industry to forgive Gibson. The idea is entirely plausible, but Downey has also said before that he doesn’t want to return for fourth Iron Man film, and this particular interview didn’t really give him a way to reiterate that without making it look like he was leaving his friend hanging. Downey will return as Tony Stark in Avengers: Age of Ultron, opening May 1.